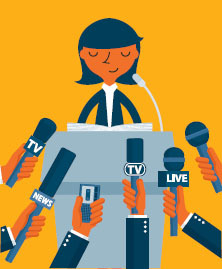 Being in the media spotlight can feel like a daunting prospect, but stick to what you know and you generally cannot go wrong, says Nursing Standard editor Graham Scott. ‘Opportunities to promote your work to a wider audience don’t come along that often, so my advice is make the most of it – and bang the drum for your profession,’ he says. Think about your key message. Keep it simple, concise and use everyday spoken language, avoiding jargon. ‘And don’t worry about any silences. It is the journalist’s job to fill them, not yours,’ says Mr Scott. Use real life examples to bring the subject alive. Use statistics, but keep them meaningful. For example, ‘Half of our patients say they want X, while one quarter prefer Y’. Try to put yourself in your patients’ shoes. What questions might they have? And how would you answer them? Think about any difficult questions, but do not prepare written answers to read out or memorise, as your interview will sound stilted and fake. ‘No one expects you to be word perfect. Your aim is to sound natural, rather than slick,’ says Mr Scott. For those keen to boost their profile using social media, the RCN has published a guide to getting started on Twitter. This includes information on registering, following, retweeting, hashtags and top tips to get you noticed. The RCN guidance sagely advises: ‘Be yourself but don’t tweet anything you would not want your manager or a journalist to read’.